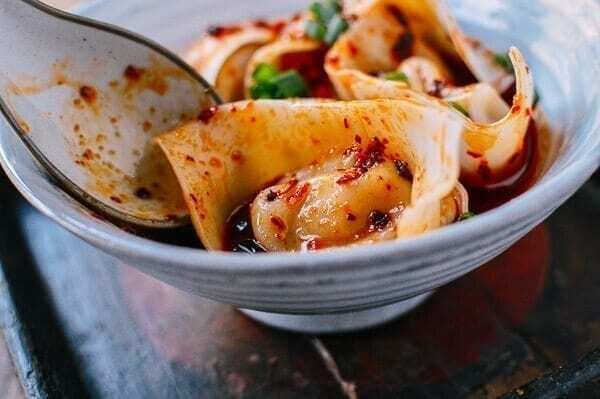 Sweet, savory, garlicky, and not as spicy as they look, Sichuan spicy wontons (aka Hong You Chao Shou, 紅油抄手, in Mandarin) are a delicious combination of sweet soy sauce, raw garlic, roasted red chili, and a touch of vinegar to balance things out. 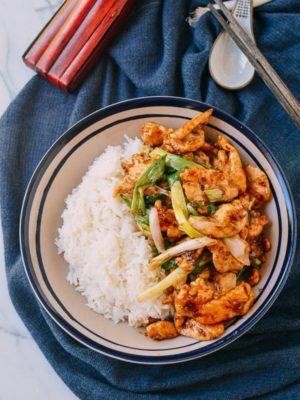 In the U.S., we’re in the midst of a huge explosion in the popularity of Sichuan food. 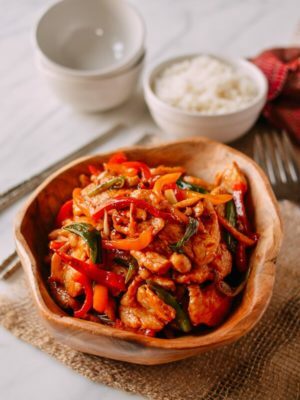 Sichuan and Hunan-style restaurants are appearing in all of the major cities, and we like it! 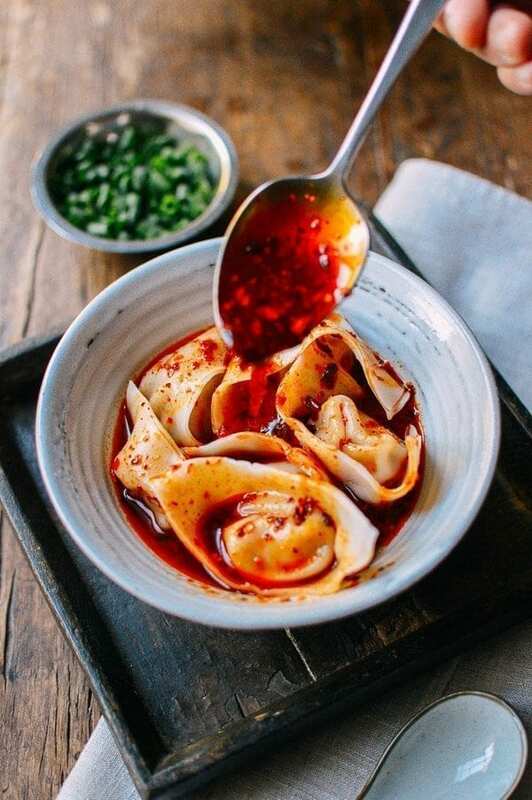 No matter where we travel in the U.S.–New Jersey, New York, Chicago, Houston, or Seattle–we always seem to find Sichuan cuisine, and these red chili oil wontons are one of the best Sichuan-style appetizers you can find. 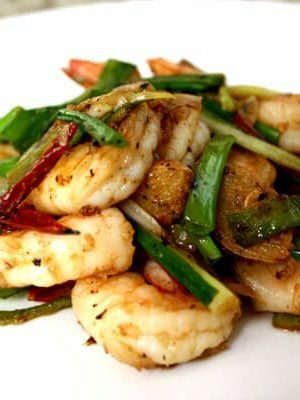 Needless to say, we all love Sichuan and Hunan food, and all of the spice that goes with it. These wontons are truly tasty with an astoundingly great flavor. I fell in love with them the first time they made it to our table while eating out. 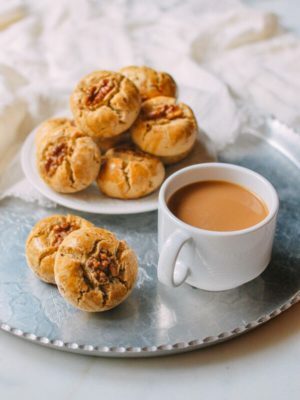 Naturally, I decided that we needed to document a go-to recipe for ourselves, and, of course, for our faithful readers to enjoy as well! 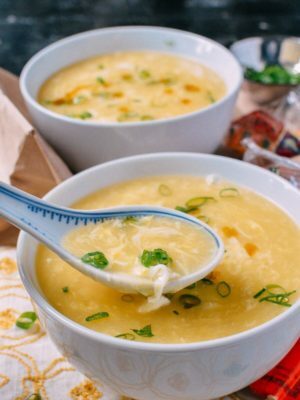 You can follow the classic Sichuan wonton recipe in this post or also use a different wonton like the ones in our popular simple wonton soup. 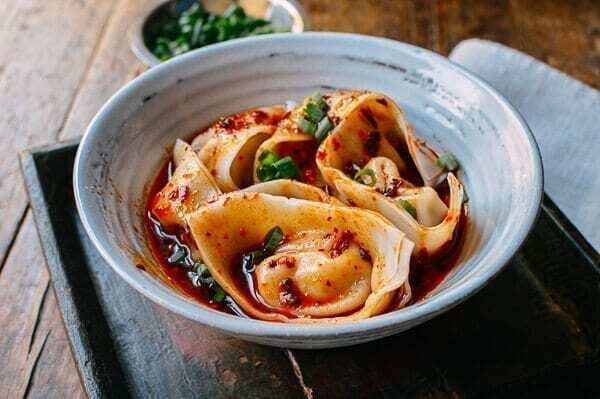 Homemade roasted chili oil is an important ingredient that makes these spicy wontons special and sets them apart from most restaurant versions. 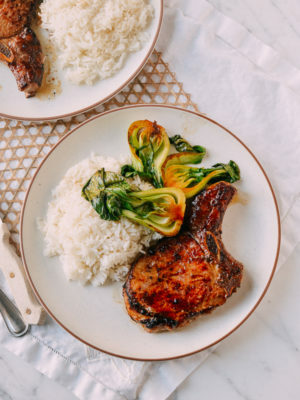 Raw garlic is also an essential ingredient—so skip these for date night! 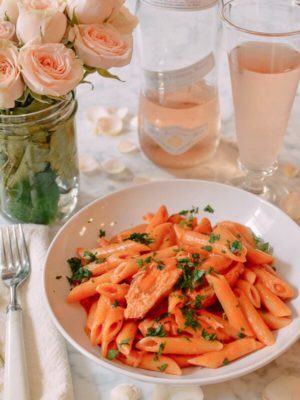 Follow our recipe first and see how you like it the way we make it, and then you can adjust the amount of ingredients in the sauce to your own preferences. Some like their spicy wontons garlicky, sweeter, more vinegary, saltier, or spicier, so have it your way! 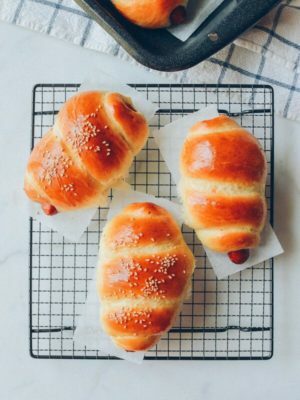 Here’s how you make these! Start by making the chili oil. You can follow our easy homemade chili oil recipe here. 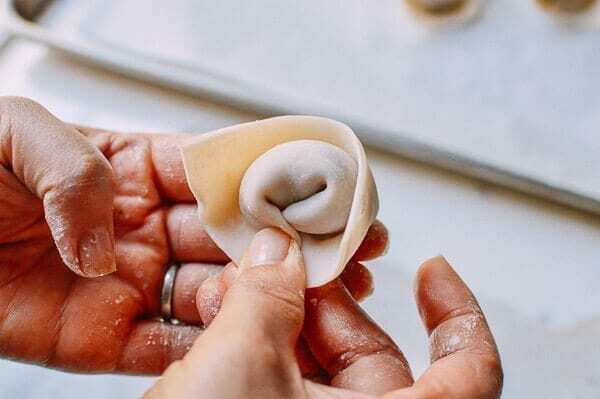 Next, add all of the wonton filling ingredients to a bowl (everything from the pork to the white pepper) and whip everything together by hand for 5 minutes or in a food processor for 1 minute. You want the pork to look a little bit like a paste. To make the wontons, take a wrapper, and add about a teaspoon of filling. Use your finger to coat the edges with water or egg wash (this helps the two sides seal together). 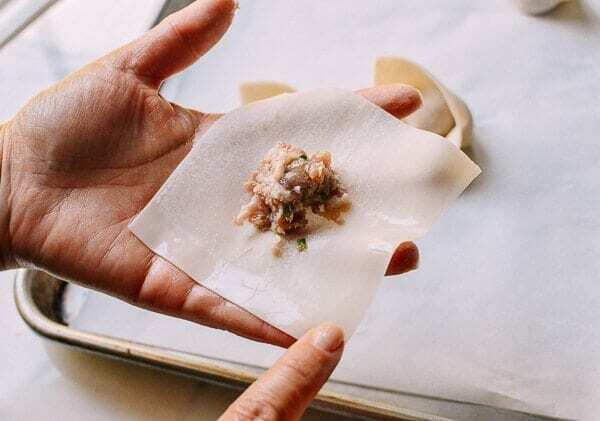 Fold the wonton in half so you have a rectangle shape. Bring together the two outer corners so they overlap slightly, add another drop of water or egg wash, and press to seal. The two outer corners are overlapped slightly to resemble crossed hands, which is literally what the “chao shou” means in the mandarin name, Hong You Chao Shou (紅油抄手). Keep assembling until all the filling is gone, which should make you about 18 wontons. Like all wonton recipes, you can double or triple the batch, eat some, then freeze the rest for another day. Place the wontons on a baking sheet or plate lined with parchment paper to prevent sticking. Boil a pot of water for the wontons. While the water is coming to a boil, make the sauce by mixing all of the ingredients together in a small mixing bowl. 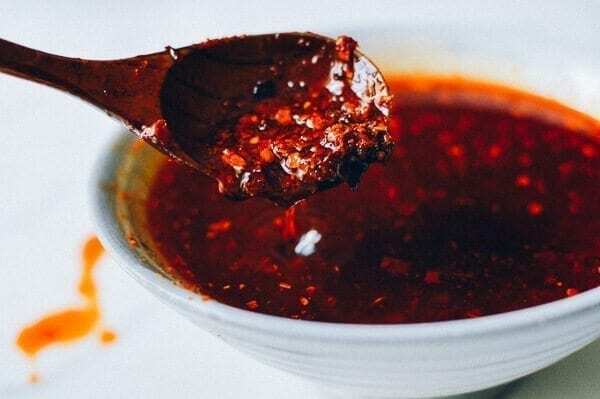 If you like spicy, add more of the chili peppers and not just the oil from your homemade chili oil. This recipe makes enough for 18 or 20 wontons. Give the boiling water a good stir and drop the wontons in, being careful not to crowd them. Continue stirring so they do not stick. Adjust the heat to achieve a low boil, and cook the wontons for about 2 minutes or until the wrappers begin to look translucent. I like mine a little bit al dente, so I take them out right at 2 minutes when they float to the top. Use a slotted spoon to drain the water and transfer the wontons to a serving bowl. Stir in 1/4 cup of the boiling water into your sauce, then pour the sauce over the wontons. You can see why this Sichuan spicy wontons dish is sometimes called red oil wontons! 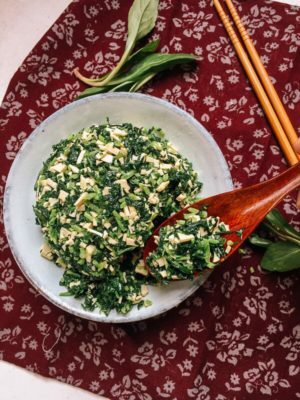 Garnish with scallion if using and serve! 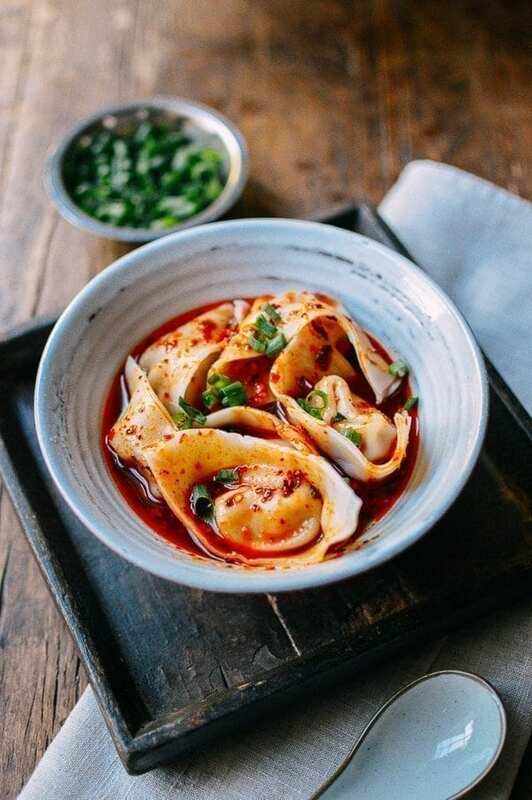 If you like it spicy, you cannot pass up this Sichuan red chili oil wonton! 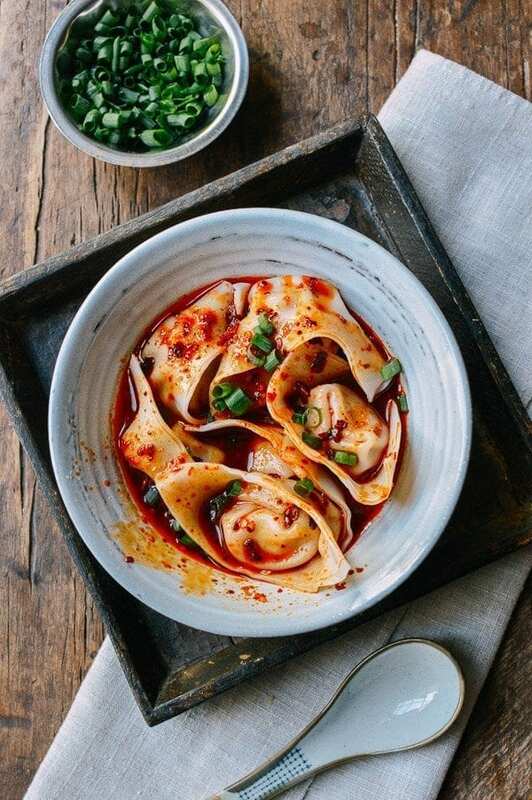 These Sichuan Spicy Wontons are the perfect appetizer or main course meal. The sauce features an amazing blend of flavors. 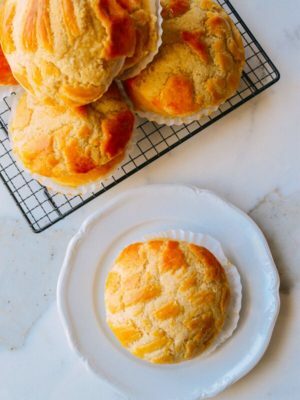 Check out our homemade recipe. 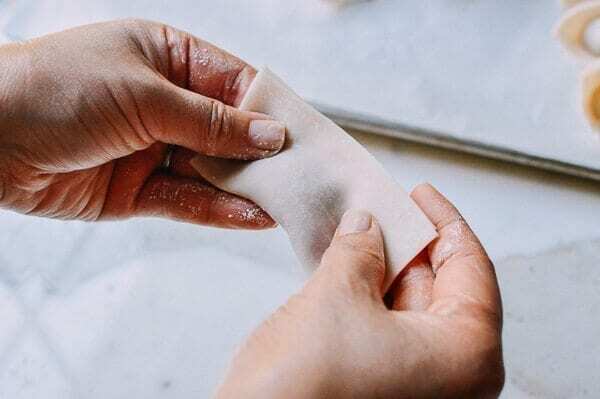 Fold the wonton in half so you have a rectangle shape. Bring together the two outer corners so they overlap slightly, add another drop of water or egg wash, and press to seal. Use a slotted spoon to drain the water and transfer the wontons to a serving bowl. Stir in ¼ cup of the boiling water into your sauce, then pour the sauce over the wontons. 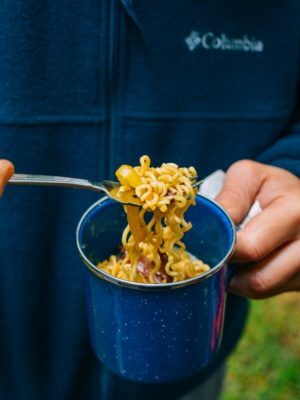 Garnish with scallion if using and serve! 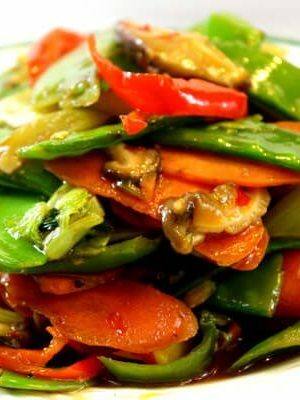 Can I use this recipe to make Spicy dumplings Szechuan style? Hi Vic, yes, you can substitute dumplings for the wontons. This is one of the yummiest recipes I’ve made. I always thought making won tons would be hard, but this was so easy, and incredibly tasty. I definitely recommend making the chilli oil too, together it’s an explosion of flavour. I made this for guests and family 4 days in a row and it was such a hit. Now I’ve made about 100 wontons and frozen them for next time. Thanks so much for the great recipe!! This recipe looks good. 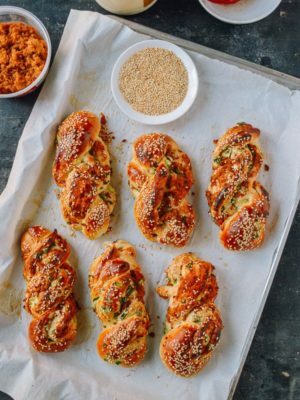 If I have neither sesame paste nor tahini, will home-made pounded sesame seeds do? Hi Siew, I think that would work, but I suggest you toast the seeds first. If you don’t have peanut allergies, peanut butter is a good sub also. Hi Siew, the actual sesame seeds will work, but it will affect the texture and the overall eating experience. Hi TA, if you are allergic to peanuts, please for sure omit it. It will still taste great. This dish look amazing delicious. The color of red is inviting to any culinary appetite. I will make it, but use tofu. I am a vegetarian. I will keep you updated on my vegan dish. Thanks for the recipe. Hi Moe, we have been working on some vegetarian wonton recipes as well. 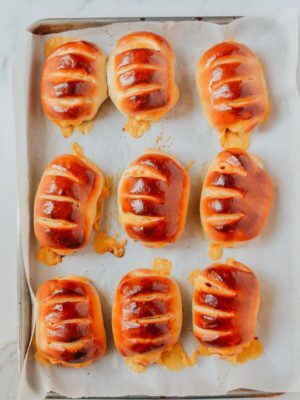 Hope you like the sauce for these spicy wontons! 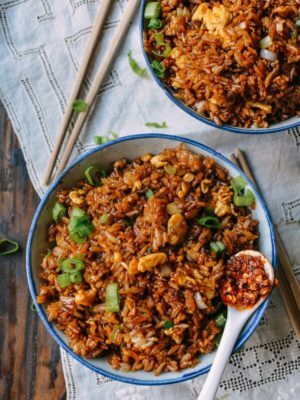 The look of the red oil and sweet and spicy soy sauce is irresistible indeed! Hi Han, You can use a store-bought chili oil, but the downside of is that usually you just get the oil and not the chili flakes with it. 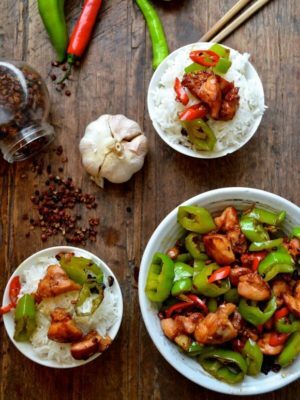 Try Kaitlin’s chili oil recipe and make your own batch. It’s a time investment, but you can enjoy it for months! There’s quite a few chill oils sold that have the chili flakes in it, and it should be obvious when you’re in the store which ones do and don’t have it. My favorite is the Lee Kum Kee brand, and it’s called Chiu Chow Chili Oil. Sometimes Szechuan restaurants will have their own home made chili oil (chili flakes, black beans, etc) for sale. 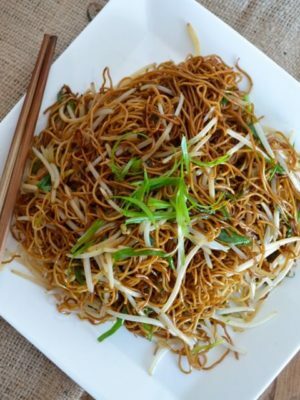 Hi Amy, Chiu Chow oil is really tasty and we also have a recipe for homemade Chiu Chow oil by Kaitlin HERE that does not have any preservatives or MSG added. Good point that many restaurants have their own versions of the chili oil with different flavors and levels of toastiness, red color, and spice level. Do these wontons freeze well? Hi Marie, The wontons do freeze well as long as you place them on a flat sheet pan lined with plastic or parchment with room between each one. 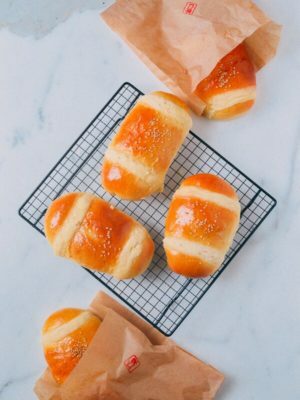 Once they are frozen, you can transfer them into a plastic freezer zipper bag, but the transfer must be quick because they thaw quickly and will stick together if you don’t work fast. You also must be gentle with storage, or the wonton skins will shatter into fragments and make a mess. 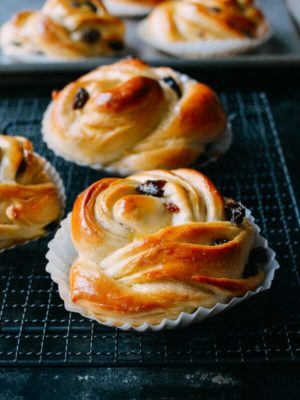 Try to use them within a few weeks, or they may get freezer burn and become dry and brittle. Hope that helps! I made the chili oil following the recipe exactly except that I doubled it since I have three teenage boys to feed. The chili oil looked nothing like your photos. I think the tahini emulsified the oil so that it looks like salad dressing. Hi Sant, yes, if you shake things up or stir vigorously, it will likely emulsify like a salad dressing. 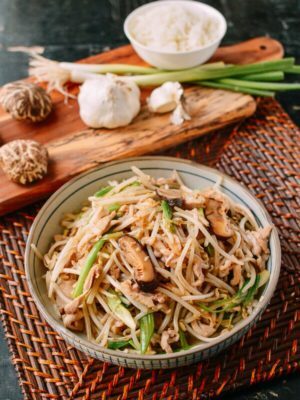 Just a simple stir to combine the ingredients is all you need!